With so much interest in a scroll saw mobile bases, I thought Iʻd share the one I made for my DeWalt 20 inch scroll saw (( PIC #1)) several years ago. It has worked fine. It was designed to keep the scroll saw table about the same height from the floor by resessing the wheel wells (( PICs #2 & #3)) for the 4 swivel/locking casters that are sold for a router table. A permanently mounted foot switch was also incorporated into the design. With all 4 casters locked, there is no movement of the scroll saw. If you want to see how I made the drawers, you can see my previous post. The little platform under the drawers is a foot rest if I use a stool to sit for extended periods of scroll sawing. Thanks for looking and I hope this gives you some ideas for your own scroll saw mobile base. Very nicely done—I like the way you designed your recessed wheel wells. I planned to use some of the design elements of my shop fox dollies , this one adds to my imagination! I have to wait 22 days to get some springs. GRRRR! I like the incorporation of the foot pedal … good idea! I like your design and this is one of the projects I need to do yet. Thanks for the nudge!! Finally got my saw on castors a couple weekends ago and was deciding how to build my drawer unit. I really like what you did there – especially the foot rest. When working standing in one place for long periods, I often flip a bucket upside down to set one foot on. It relieves stress on the back to have one knee bent. With your design I could use that foot rest while sitting on a stool or standing. Thanks for the great ideas!! 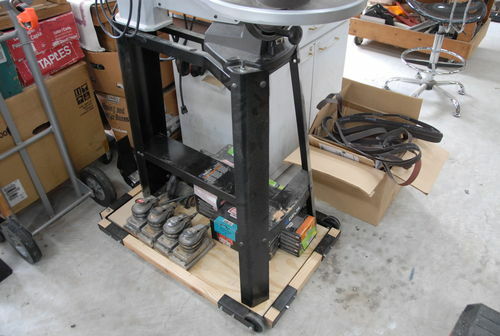 Thanks for sharing this exceptionally well executed mobile base-storage-ergonomic scroll saw station solution!!! I have the DW788 with the stand. I wasn’t sure if I was going to use it or build my one…. Now I will do both!!! Very good! It’s a little like the base I built for my DeWalt Radial Arm Saw last week. If anybody remembers what that is and cares, I’ll get some pictures and post them. The RAS is somewhat heavier than the scroll saw but I found a way to do it. (The table weighs around 40 lbs). Post on twitter if you’re interested. Another mobile base from the master of mobile base design . Great design and proven over the years . Thanks for posting this and a Sketch Up would be of help for many ! I like the use of space for storage. Also the foot pedal. Great idea. Very nice. I didn’t have the stand for my 788 so used one side of an old desk as a base. Removed the bottom drawer as that made room for a foot rest. Also elevated the rear of the saw as that relieves shoulder strain while sawing. Kepy—Just curious … what degree slant would you say you realized when you elevated the rear of your saw? I have the same saw. I WILL be doing this. I am so tired of all my scroll saw stuff being everywhere except near my scroll saw.